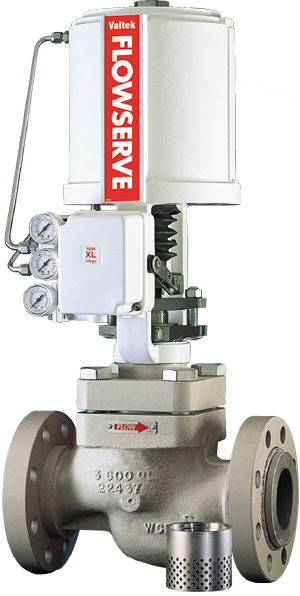 MegaStream trim effectively reduces control valve noise in a range of gas applications. MegaStream trim is available in two styles: a very economical, interchangeable one-or two-stage design for noise reduction up to 15 dBA, and a highly effective multi-stage design for noise reduction approaching 30 dBA. MegaStream trim eliminates the problem of control valve noise by dealing effectively with gaseous pressure reduction, and by controlling turbulence carried into the downstream piping. The pressure drop in MegaStream trim is distributed so that it occurs not only at the throttling point between the plug and seat, but also at each stage, from the inside of the attenuator to the outside. This pressure drop occurs largely as a result of the sudden expansions and contractions that take place as the flow passes through the MegaStream trim. Each stage is designed to take a small pressure drop, avoiding the high velocities present in single-throttling-point trims. This gradual pressure reduction is achieved by designing sufficient stages to keep the velocity low.